Anyone who can access the Internet can be part of the knowledge-access, knowledge-building, information-exchanging culture, regardless of location. Time magazine's latest “Person of the Year” is “You”(Grossman, 2006). In a startling acknowledgement that “community and collaboration on a scale never seen before” has trumped any famous individual, the editorial board elected to pay tribute to the power of the World Wide Web-and some of its most famous creations such as Wikipedia, YouTube, MySpace, and Web logs or blogs. This research is about blogs and their use in a new teacher professional development project. Loving, C.C., Schroeder, C., Kang, R., Shimek, C. & Herbert, B. (2007). Blogs: Enhancing Links in a Professional Learning Community of Science and Mathematics Teachers. 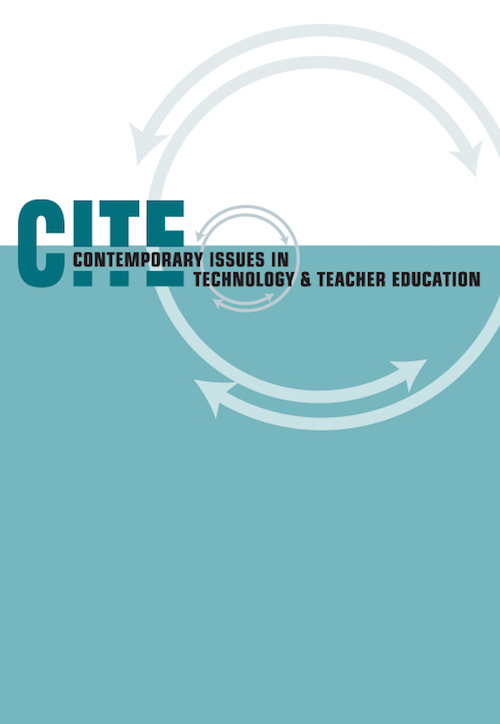 Contemporary Issues in Technology and Teacher Education, 7 (3), 178-198. Waynesville, NC USA: Society for Information Technology & Teacher Education. Retrieved April 20, 2019 from https://www.learntechlib.org/primary/p/24373/. Barab, S.A., MaKinster, J.G., Moore, J.A., Cunningham, D.J., & The ILF Team (2001) Designing and building an on-line community: The struggle to support sociability in the inquiry forum. Educational Technology Research and Development, 49(4), 1042-1629. Belcher, D.D. (1999). Authentic interaction in a virtual classroom: Leveling the playing field in a graduate seminar. Computers and Composition, 16, 253-267. Bonk C.J., Malikowski, S., Angeli, C., & East, J. (1998). Web-based case conferencing for perspective teacher education: Electronic discourse from the field. The Journal of Educational Computing Research, 19(3), 269-306. Bonnstetter, R.J. (1998). Inquiry: Learning from the past with an eye on the future. Electronic Journal of Science Education, 3(1), 130-136. Cavanaugh, C. (2003). Information age teacher education: Educational collaboration to prepare teachers for today’s students. TechTrends, 47(2), 24-27. Darling-Hammond, L. (1997). Quality teaching: The critical key to learning. Principal, 77(1), 5-11. Dietz-Uhler, B., & Bishop-Clark, C. (2001). The use of computer-mediated communication to enhance subsequent face-to-face discussions. Computers in Human Behavior, 17, 269-283. Dykes, M.E., & Schwier, R.A. (2003). Content and community redux: Instructor and student interpretations of online communication in a graduate seminar. Canadian Journal of Learning and Technology, 29(2), 79-99. Eick, C., & Dias, M. (2005). Building the authority of experience: The development of preservice teachers’ practical knowledge through coteaching in inquiry classrooms. Science Teacher Education, 89(3) 470-491. Ferdig, R.E., & Trammell, K.D. (2004). Content delivery in the “Blogsphere.” Technological Horizons in Education Journal, 20(2), 232-247. Fey, M.H., & Sisson, M.J. (1996). Approaching the information superhighway: Internet collaboration among future writing teachers. Computers and Composition, 13, 37-47. Friedman, T.L. (2005). The world is flat. New York: Farrar, Straus & Giroux. Contemporary Issues in Technology and Teacher Education, 7(3) Grossman, L. (2006December 16). Time’s person of the year: You. Time, 168(24). Harmon, S.W., & Jones, M.G. (2001). An analysis of situated Web-based instruction. Educational Media International, 38(4), 271-280. Hernandez-Ramos Pedro, P. (2004). Weblogs and online discussion as tools to promote reflective practice. The Journal of Interactive Online Learning, 3(1), 1-16. Huang, H. (2000). Instructional technologies facilitating online courses. Educational Technology, 40(4), 41-46. Khine, M.S., Yeap, L.L., & Lok, A.T.C. (2003). The quality of message ideas, thinking and interaction in an asynchronous CMC environment. Education Media International, 40(1/2), 115-125. Kowch, E., & Schwier, R. (1997). Considerations in the construction of technology-based virtual learning communities. Canadian Journal of Educational Communication, 26(1), 1-12. Kreijns, K., Kirschner, P., & Jochems, W. (2002). The sociability of computer-supported collaborative learning environments. Educational Technology& Society, 5(1), 8-22. Kunz, P., Dewstow, R., & Moodie, P. (2003, December). A generic tool to setup metacognitive journals and their serendipitous use. Interact, Integrate, Impact, proceedings of the 20th annual conference of the Australian Society for Computers in Learning in Tertiary Education, Adelaide, Australia. Lankshear, C., & Knobel, M. (2003, April). Do it yourself broadcasting: Writing weblogs in a knowledge society. Paper presented at the annual meeting of the American Educational Research Association, Chicago, IL. Li, Q. (2003). Would we teach without technology? A professor’s experience of teaching mathematics education incorporating the Internet. Educational Research, 45(1), 61-77. Maor, D. (2003). The teachers’ role in developing interaction and reflection in an online learning community. Education Media International, 40(1/2), 127-137. Mazzolini, M., & Maddison, S. (2002). Sage, guide or ghost? The effect of instructor intervention on student participation in online discussion forums. Computers and Education, 40, 237-253. Mintrop, H. (2001). Educating students to teach in a constructivist way—Can it all be done? Teachers College Record, 103(2), 207-239. Oravec, J.A. (2003). Weblogs as an emerging genre in higher education. Journal of Computing in Higher Education, 14(2), 21-44. Prestera, G.E., & Moller, L.A. (2001). Exploiting opportunities for knowledge-building in asynchronous distance learning environments. The Quarterly Review of Distance Education, 2(2), 93-104. Robertson, A. (2007). Development of shared vision: Lessons from a science education community collaborative. Journal of Research in Science Teaching, 44(5), 681-705. Rovai, A.P. (2000). Building and sustaining community in asynchronous learning networks. Internet and Higher Education, 3, 285-297. Rovai, A.P. (2001). Classroom community at a distance: A comparative analysis of two ALN-based university programs. The Internet and Higher Education, 4, 105-118. Schwier, R.A., & Balbar, S. (2002). The interplay of content and community in synchronous and asynchronous communication: Virtual communication in a graduate seminar. Canadian Journal of Learning and Technology, 28(2), 21-30. Tobias, S. (1990). They're not dumb, they're different: Stalking the second tier, Tucson: Research Corporation. Toner, M. (2004). ‘Blogs’ help educators share ideas, air frustrations. Education Week, 23(18), 8-10. Tu, C., & Corry, M. (2003). Designing, management tactics, and strategies in asynchronous learning discussions. The Quarterly Review of Distance Education, 4(3), 303-315. Vonderwell, S. (2002). A examination of asynchronous communication experiences and perspectives of students in an online course: A case study. The Internet and Higher Education, 6, 77-90.